It has come to my attention that my client [CHRISTMAS] contends that you [HANUKKAH] have infringed upon Christmas’ position as the preeminent gift-giving holiday during the cold weather months of November and/or December. My client demands that you cease and desist your existance as a gift-giving holiday immediately. I understand that you [HANUKKAH] are a "festival" and not a holiday. However, you and my client [CHRISTMAS] are constantly grouped by the politically-correct masses into the same category. 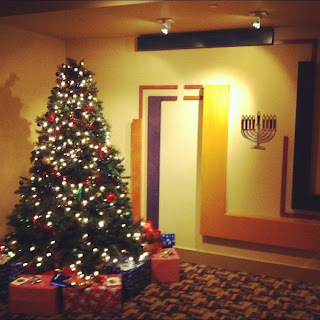 · Menorahs (H) vs. Christmas Trees (C). A free-standing symbol of holiday cheer consisting of lights and flames. · Potato Pancakes(H) vs. Buttermilk Pancakes (C) Honestly, did you really have to re-invent the pancake? · Dreidels (H) vs. Assorted Gambling (C). Dreidels are a cheaper knock-off of dice--which are supposed to have six sides. The only gambling allowed during the holiday season is reserved for College Bowl Games. · Eight Nights (H) vs. Christmas Eve (C). The nights of Hanukkah are artificially inflated, my client alleges, to overlap with Christmas every few years. Unacceptable. · Adam Sandler (H) vs. Bing Crosby (C). Mr. Sandler's "humorous" incarnations of the Hanukkah song are a rip on Bing Crosby’s White Christmas. And all he does is name celebrities that are Jewish. That's not a song, that's a Wikipedia page. You must cease and desist all attempts to emulate Christmas immediately. Should you not comply, Christmas will write another Cease and Desist letter each year until you come into compliance. You will be responsible for an eternity of attorney fees, plagiarism, royalties, individual and/or class-action law suits on behalf of Christmas.